Tensions escalate between Israel and Hamas. The Sterlings battle for control of the Clippers. And a judge approves a settlement in NFL concussion lawsuit. No let up: Rockets fly as tensions soar between Israel and Hamas. Hamas said there were dozens of Israeli airstrikes across Gaza overnight. Israel is calling it "Operation Protective Edge." The Israeli military has already called up several hundred reservists and is prepared to add 1,500 more, a spokesman said. The escalation in violence started with the deaths of three Israeli teens and the killing of a Palestinian youth, possibly in retaliation for their deaths. One on one: The Sterlings - Donald and Shelly - are back in court today. They're duking it out over who controls the Los Angeles Clippers and who has the right to sell the NBA team. Shelly Sterling negotiated a $2 billion deal to sell the Clippers to former Microsoft CEO Steve Ballmer for $2 billion after she had her husband declared mentally incapacitated. The court will have to decide if she followed proper procedure in doing that. Bullets fly: Chicago's police superintendent lashed out after a violent Fourth of July weekend that saw more than 60 people shot and nine killed. He put the blame squarely on what he called lax state and federal gun laws. This year, as of June 29, Chicago police had recorded 880 shooting incidents, an average of nearly five a day. Final ruling in November: A federal judge approved Monday a preliminary settlement in a class action lawsuit filed by thousands of former NFL players against the National Football League. The settlement will provide eligible retired players with baseline neurological exams and include monetary awards for diagnoses of ALS, Parkinson's disease, Alzheimer's disease and early and moderate dementia. There is no cap on the amount of funds available to pay these monetary awards and all valid claims will be paid in full for 65 years. In the crosshairs: The Obama administration has a full-blown crisis on its hands as thousands of undocumented immigrants crowd the U.S.-Mexico border. Especially troubling is the high number of children which poses logistical problems as border patrol officers try to cope with the onslaught. Republicans are making political hay with this and even a few Democrats have had harsh words for how the White House is handling things. –This is unfortunate: You couldn't buy this type of publicity, if you wanted to. And believe us, you wouldn't want to. Isis, the mobile wallet service, will rebrand so there's no confusion with ISIS, the Islamic State of Iraq and Syria, a terror group. There's no word yet on what the new name will be. - Tour de Selfie: Cyclists in the Tour de France have a new obstacle to avoid as they hit the roadways of Europe. Folks snapping selfies were getting within inches of the riders as they whizzed by over the weekend. American rider TJ Van Garderen called it "A dangerous mix of vanity and stupidity." - Dogged argument: The message is clear: "You're lucky there's a fence here or I would tear you apart." - Viva bungee: It's time to bungee jump in Mexico and GoPro catches the action. Bring a change of underwear. - Cutest little critter EVER: Is there anything more adorable than a sleepy baby hedgehog? We don't think so. Did I miss the memo? How was the name Isis chosen in the first place for the mobile wallet service? Is it a family name or do the letters stand for something? Bad choice. 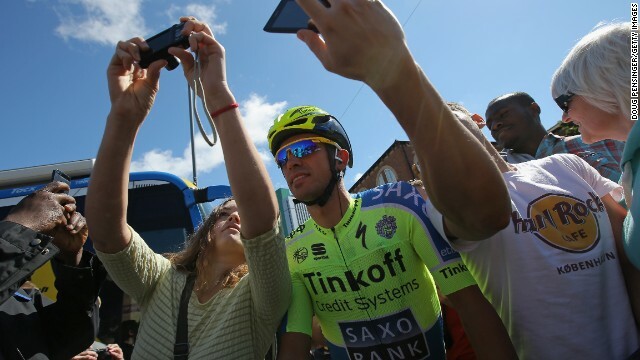 What asinine, inconsiderate, clueless so- called " selfies" who had not only compromised the riders in the Tour de France but also the spectators as well. Just to show anyone interested that they were at the event. Unbelievable!!!!!!! !